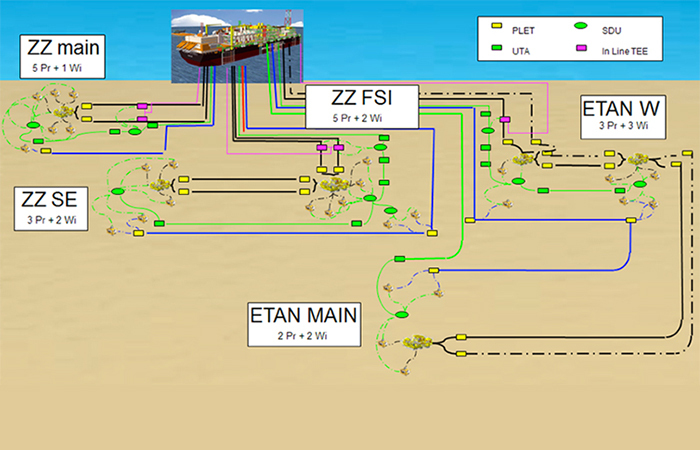 Tecnoconsult performed the FEASIBILITY study of a subsea development system, including 5 clusters, infield flowlines (rigid and flexible) connecting clusters to an FPSO and export pipeline conveying gas to onshore plant. The performed activities covered all the concept selection phase including ITT package development for FEED. The scope of the design activities has been the selection of the most promising scenario for the OPL245 field development. To this purpose, different solutions in terms of system architecture, pipelines diameter, production flowlines thermal insulation requirements, etc. have been investigated. Different field layouts and architecture schematics, as well as flow assurance studies, PFDs definition and pipeline diameter selection, have been developed for each investigated scenario. Design activities, covering all the major design aspects (sizing, stability, pipe-bottom interaction and free spans assessment, in service buckling assessment, preliminary layability analyses), have been carried out for all the gas export, production and water injection lines.